ADI’s campaigns, investigative work and rescue operations consistently attract endorsements and backing from celebrities and high profile figures. Their invaluable support helps us to reach a wider audience and raise awareness of the vital issues affecting animals around the world. Here are some endorsements from celebrities, whose support has helped thrust our campaigns into the public eye. ADI is very grateful for their participation. 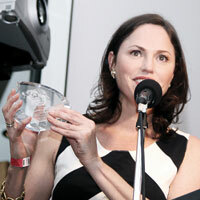 Jorja Fox is known to 73 million viewers worldwide for her role as Sara Sidle in TV’s CSI – she is also a great advocate for animals, a campaigner and loyal supporter of ADI. Jorja has been an ADI Ambassador since 2008 and was the winner of our ADI Animal Champion Award in 2012, in recognition of her work to protect animals and her support for ADI’s work. From speaking in Congress, to spearheading media campaigns, or waiting patiently to ensure ADI arrived safely on our lion rescues, Jorja has been there for ADI – and for the animals. Parade.com has just published an interview where Jorja discusses her work as an ADI Ambassador. Read the article here. "Absolutely Fabulous,” “The New Avengers,” “On Her Majesty’s Secret Service,” “Trail of the Pink Panther"
“Notes on a Scandal,” “Shirley Valentine,” “Fresh Fields,” “Agatha Christie’s Marple"
"The Government needs to listen to the will of the Great British public and implement a wild animals in circuses ban without further delay. Their decision is flawed and needs rapid review. I urge the Minister to reconsider." "Indiana Jones and the Last Crusade,” “Alexei Sayle’s Stuff,” “The Young Ones,” “The All New Alexei Sayle Show"
"no one with an ounce of decency could see the footage of poor Anne being tortured without being heart-broken. There are many grey areas in matters of morality - using wild animals in circuses is not one of these grey areas. It is simply and obviously wrong and indefensible. The sooner this blot on a civilised country is eradicated the better it will be for all of us - animals and humans." "A common technique for training animals is to break their spirits by totally subjugating them. Imprisoned animals often sway repetitively on the same small patch of ground, emitting no sound, but surely they scream from within. When we fully acknowledge the fact that animals are sentient, we blur the lines between them and us and quickly learn to respect and protect them. The sooner we ban maltreatment of animals for entertainment purposes, the better." “I am amazed that wild animal circuses still exist in the UK, and like the vast majority of the public and politicians I want to see a ban on their use once and for all - and I want this to happen now. Successive governments have been mulling this issue over now for far too long, and it is high time that the Coalition Government acted decisively to bring an end to this animal suffering - once and for all. They have been provided with all the evidence and information that they need and it is time to now listen to the will of the UK public." "I’m All Right, Jack,” “Two-Way Stretch,” The “Carry On” movies, “Randall and Hopkirk (Deceased),” “Crown Court,” “The Bill,” “Foyle’s War,” “Birds of a Feather,” “Minder,” and “Holby City"
"Stand By Me,” “The Lost Boys,” “The Two Coreys"
"Any circus that travels with live animals is something to stay away from...it’s best for now to just stay away from any circuses at all that feature live animals. They can do just as good a job going to a Cirque du Soleil, it’s widely entertaining and it keeps everybody safe." Judge, “Dancing with the Stars"
“Bold Native,” “Glee,” “The Muppets Movie,” “STOMP,” “Garden of Eden,” “Raze,” “Criminal Minds,” “Video Game Reunion,” “Tonight Show With Conan O’Brien,” “Larry Gaye: Renegade Male Flight Attendant,” “Kill Corporation"
"I have adopted a macaque monkey named Betty through ADI. It gives me great joy to know that she is free and happy and playing with her monkey friends, Boo and Baloo, and that I am helping to make this possible." "Little Fockers,” “My Duet With Mick,” “Kat Kramer’s Films That Change The World"
"The movement to defend and protect our animal friends and end their exploitation is gaining considerable strength with each day, and organizations such as Animal Defenders International have played a pivotal role in bringing that to pass. I am proud to support their incredible efforts to empty cages and awaken hearts and minds worldwide." Over 250 people attended ADI’s star- studded “Lion Ark Night” fundraiser at the home of host James Costa in the Hollywood Hills to support the Lion Ark movie, and the campaign to end animals in traveling circuses.